Sunday August 9- 1931 Le Grand took me to SS & Church. I rode home with Elmer Anderson. The weather has changed. I slept in the afternoon and wrote Mattie Stitt and Will Work. Evening over at Byintgons. 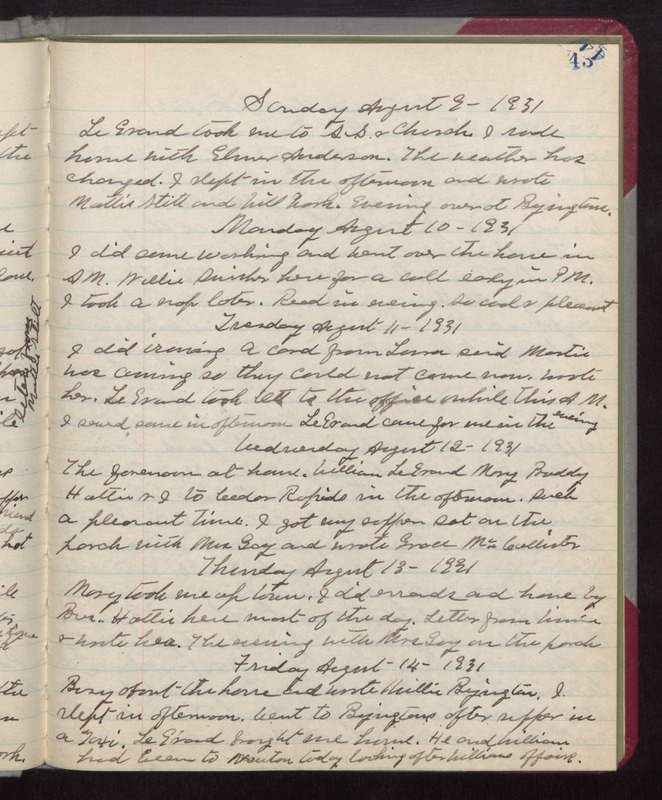 Monday August 10- 1931 I did some washing and went over the house in AM. Nellie Swisher here for a call early in PM. I took a nap later. Read in evening. So cool & pleasant Tuesday August 11- 1931 I did ironing A card from Laura said Martie was coming so they could not come now. Wrote her. Le Grand took Ott to the office awhile this AM. I sewed some in afternoon LeGrand came for me in the evening Wednesday August 12- 1931 The forenoon at home. William LeGrand Mary Buddy Hattie & I to Cedar Rapids in the afternoon. Such a pleasant time. I got my supper Sat on the porch with Mrs Gay and wrote Grace McCallister Thursday August 13- 1931 Mary took me up town. I did errands and home by Bus. Hattie here most of the day. Letter from Winnie & wrote her. The evening with Mrs Gay on the porch Friday August 14- 1931 Busy about the house and wrote Millie Byington. I slept in afternoon. Went to Byingtons after supper in a Taxi. Le Grand brought me home. He and William had been to Newton today looking after Williams affairs.